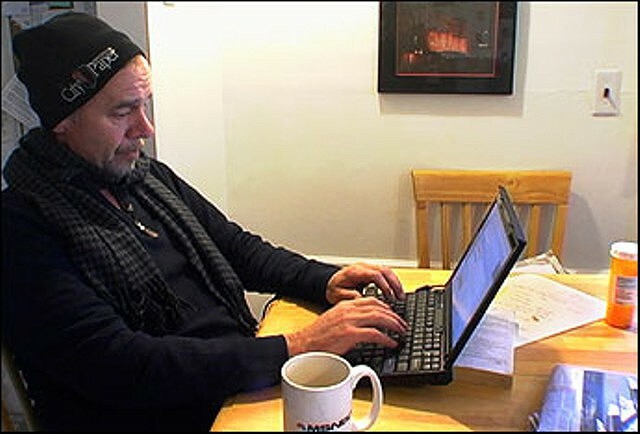 I first became entangled in David Carr’s Irish eyes and impish grin about 20 years ago from the short distance between my shoulder and my fingertips holding a match to his unlit cigarette. Or, maybe it was the other way around. We were smoking, though—bad boys skipping out on a session during a convention of the Association of Alternative Newsweeklies (AAN). In which city that was, I don’t recall. Could’ve been Boston. Or Nashville. Or maybe it was Austin where I met Carr. Smokers are moths, attracted to other smokers. Twenty years ago, there were lots of us blowing smoke, literally and figuratively, as we young lions, and lionesses, too, shared our successes and failures about this thing called “alternative journalism” to which we were all wed. Editors, publishers, production artists, sales reps, it didn’t matter. So long as you smoked, you were welcome to join in any such spontaneous “board meeting” where you might enter with a new idea for compensating distribution drivers and leave with a cover-story idea that worked in Cleveland. A good number of us began to value those informal gatherings more than the formal sessions themselves. Smokers, by definition, are delusional. Gradually, fewer and fewer persons attended the impromptu board meetings. Clif Garboden, the editor of The Boston Phoenix, died of oral cancer. Tom Yoder, an owner of the Chicago Reader and the Washington City Paper, for which David Carr worked, survived throat cancer. He told me Monday he’s doing well and counting his blessings—for beating cancer and for selling his papers at the best possible time. On Tuesday, he will find his way to St. Ignatius Loyola Catholic Church on Park Avenue in Manhattan to bid goodbye to perhaps his greatest employee ever, David Carr, who died last week of everything, including lung cancer. As the cliché goes, David was “only” 58 years old. I swear he was older than me, but he was not. He was simply a wiser soul, a deeper thinker, a more generous human being, a quicker wit, an abhorrer of pretense, a friend and mentor to scores of journalists, a thrill to share a meal with and, as hard as this is to take, a much better skier than I ever was. Before he became a journalistic meme at The New York Times, where he worked as a media critic since 2002, David and family spent a winter vacation at my home. Each day, David rose early, grabbed his rented parabolic skis and made short work of Utah’s famous snow, including one full day at Alta—the David Carr of American ski resorts—with our then editor, Christopher Smart. Chris, an expert skier, was agog that pudgy and smoking David skied so well and so fiercely. Despite David leaving our industry around the year 2000, the puff-filled board meetings continued. Missing him, in those first years we asked, “What’s David up to?” Of late, the query became, “How’s David?” We had seen the pictures and videos. David hadn’t merely moved past us, he was painfully moving beyond us all—he evidently, like us, frail and vulnerable after all. During his Utah visit, I cooked a Dutch oven meal. David had never tasted Dutch oven cooking (hard to believe, giving his dining propensity) and his compliments were lavish. No one could pay a compliment like David. I once saw him compliment an Excel spreadsheet. I was so taken that I later sent him a Lodge Dutch Oven, which cost more to ship than to buy. He gave the oven a name—Dutch—and assured me that Dutch kept him company in a cabin in upstate New York where he was writing his autobiography. And so it was. He told me things he said he never told anyone else. Perhaps, but everyone who knew David felt he shared something with them only they were privy to. All of us were his best friend. He was all of ours. That night, he told me he had once yearned to be a comedian, a standup comic. That would explain his impeccable timing, his witty phrasing, his perfect pauses and use of the air that blew between him and whomever was in front of him. In another year, I was at a Sundance party and bumped into the comedian and actor Tom Arnold. Following one disengaged, “Oh, thank you, uh-huh, oh, you’re so nice” after another, he took my hand and began his proscribed mantra, when I said, “David Carr’s staying at my house, and he says hello.” The look on Arnold’s face—that look a Midwestern boy might get when he finds a Flexible Flyer under the Christmas tree or a perch on the end of his ice-fishing line—said it all: David Carr had entered his troubled soul, too. A couple of days later, David told me he and Tom Arnold met up and skied together. There’s a joke in there somewhere. I learned David had died thanks to The New York Times alerts that he introduced me to. A few hours later, #DavidCarr was trending on Facebook and Twitter. Some trend. It’s barely ironic that character count-challenged Twitter owes some small debt to such a fantastically funny and prolific storyteller. But, that’s about right. Stories are the coca plant of today’s storytelling ecosystem. Stories are picked by media outlets—the growers—then passed to aggregators and curators—the mules and the dealers—and cut into the intoxicating lines of text that are so addicting—and profitable—to the owners of the new social media. Miss you, brother #DavidCarr passes for prayer. RIP #DavidCarr passes for a eulogy. A new crop of stories will come tomorrow to feed the social beast. The road goes on forever, but the story never ends. Everyone with a keyboard is blistering their pinkies since his passing, but none can match how David might have said it about himself. David’s legacy will be that the countless persons he inspired will continue to write great stories. His evangelism for this craft is unsullied, and his acolytes will keep his candle lit. In the end, as in the beginning, he was matchless.